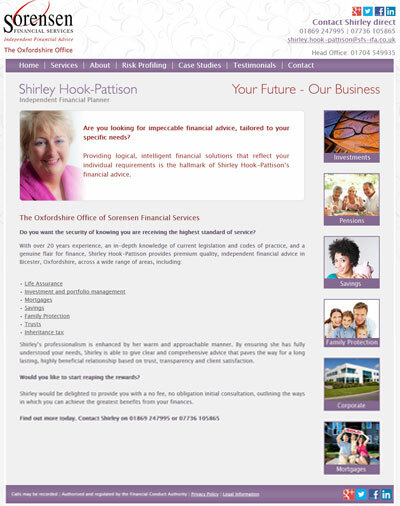 Shirley Hook-Pattison provides independent financial advice as part of SG Financial Services. SG Financial Services already had a company website but Shirley thought she could benefit from a website dedicated to the local area she predominently works in and the services she offers. Shirley approached me after we had initially met in a WIBN networking group to see what I could offer. She wanted a website that she could manage herself but was nervous of the amount of technical knowledge this might require. I reassured Shirley that the content management systems I work with are easy for my clients to look after themselves and everyone receives a one-to-one training session on the system as well. We had an initial consultation to discuss how Shirley wanted the website to look visually and how to keep the connection with Sorensen relevant as well. Also we identified who her clients are and what she wanted to ensure the website communicated to her potential market. The brief for the website was that it needed to represent Shirley’s individuality, present a professional image and provide clear information about the range of services she offers without being too technical. Shirley also opted for some additional search engine optimisation to ensure that the website was going to have a good chance of being referenced by search engines at its launch for her key search terms. “I cannot praise Joanna Craig Website Design highly enough. I really didn’t know how I wanted my website to look, as I had never been involved in the design of one before. I just seemed to know what I didn’t like. Joanna came to see me and immediately understood what I was trying to achieve and came up with a design that I liked very much. She is a very down to earth person who explains things in simple language. 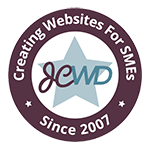 With her recommendation I chose to have a CMS website as Joanna assured me that I would be able to change the content easily. Naturally I was somewhat cynical about this, as I am basically a technophobe. However, after a training session with Joanna I found that I could, in fact, change the content and that it was simple to do so. Shirley receives regular enquiries and has generated her largest client to date since the website was launched in April 2013.